During the years immediately following the Civil War there was an inflation in values similar to that which followed our more recent World War I. The development of railroads in 1835, which was the first change in mode of transportation since Boston was first settled two hundred years before, began the transformation which was to awaken the sleepy provincial town to its destiny as the commercial and financial center of New England. The expansion which was necessary resulted in a movement into outlying sections. Among the sections greatly affected was South Boston. By the construction of bridges, and the extension of the street cars, then drawn by horses, this section was more closely linked to the city proper. During the decade between 1860 and 1870, when the steamships were landing over 20,000 immigrants on our docks each year, South Boston's population increased over fifty per cent and the taxable value of property more than doubled. Many important industries, such as iron foundries, glass works, shipbuilding, lumber and lead works, had surpassed the original fishing industry in numbers employed and annual earnings. This is the background on which the curtain rises on the existence of Rabboni Lodge. In the latter part of 1868, when there were three Lodges in South Boston — Saint Paul's, Gate of the Temple and Adelphi — fourteen Masons met to discuss the advisability of establishing a new Masonic Lodge in that section. It seems to have been a typical American group, composed of some who had achieved great distinction in the business world, and others who took a more humble part in the daily life of the community. A glance at the list of occupations discloses a merchant, trader, sailmaker, machinist, manufacturer, oil refiner, lumber dealers, horticulturalist, insurance agent, undertaker and clerk. Among the businesses represented which we still find continuing today were the Hersey Mfg. Co., James Lumber Co. and Jenney Mfg. Co. Included in the group were Worshipful Richard M. Barker and Worshipful Benjamin T. Wells, Past Masters of Gate of the Temple Lodge. Right Worshipful Benjamin Pope, District Deputy Grand Master, was present at the preliminary meeting, but did not sign the petition as a member of the group. He did become a charter member, however, as did Worshipful Edwin Tilden, Past Master of Gate of the Temple Lodge. As a result of this preliminary meeting, a petition was presented to the Grand Master, dated December 28, 1868, which was signed by thirteen of those who attended the preliminary meeting, and an additional seven. In accordance with the practice of that time, the petition bore the endorsement of Saint Paul's and Adelphi Lodges consenting to and the endorsement of Right Worshipful Benjamin Pope, District Deputy Grand Master of the Third District, recommending the establishment of the new Lodge. The Grand Master granted the dispensation on January 11, 1869, returnable at the March, 1870, communication of Grand Lodge. and they were unanimously elected. Of this first line of officers, the Senior and Junior Wardens, Senior Steward and Inside Sentinel ultimately served as Master. In 1877, the first Master who was raised in the Lodge was installed, and with one exception since then, our Masters have been chosen from among our own candidates. The second Tuesday of the month was adopted for the regular meetings of the Lodge. Adelphi Lodge allowed the use of their jewels until our own could be procured. At this first meeting three applications for the degrees were received. Hezekiah S. Tilton, one of these three, was probably the first Mason made in Rabboni Lodge. He was raised May 18, 1869. At the first annual communication, December 14, 1869, it appears that twelve men had been raised, one passed and one awaited initiation. The Treasurer's balance was $95.00. In March, 1870, the Lodge presented to Grand Lodge its application for a charter, with a copy of its By-Laws, one provision of which was that the membership was to be limited to one hundred. On March 9, 1870, the Lodge met at the Masonic Temple in Boston and was constituted in Grand Lodge at its regular quarterly communication on that date. This is an unusual distinction and is described in the newspaper of that day as the only case of its kind. The Grand Master and Wardens installed the Master and Wardens of Rabboni Lodge. The Lodge then retired to an ante-room and eight newly raised Masons were proposed for membership. Conferring of the degrees at that time did not automatically include membership in the Lodge. This regulation continued until December 12, 1882. From April 11, 1871, to May 14, 1872, the Lodge met at the Temple in Boston, during the rebuilding of the apartments in South Boston. At the close of the year 1872, the Lodge was composed of 37 members and owed the Treasurer $55.64 to balance accounts for the year just ended. Unusual expenses were incurred in connection with refitting the apartments, and the Lodge borrowed $500 from some of its members at seven per cent for refitting costs. In 1873, the year of the great financial panic, the Lodge increased in membership to 62, and had a balance of cash on hand amounting to $377.92. From the time when the apartments were rebuilt, the Lodge continued to grow slowly. In 1885 we had a membership of 93 and remained at or close to 100 for the following ten years. During this period, however, Lodge finances apparently gave considerable trouble. The Lodge frequently owed its Treasurer money and at times borrowed money from members. All of these monies were repaid. The Permanent Fund was established December 14, 1880, and at the last annual meeting had reached a total of over $10,000. November 18, 1894, the Lodge conducted the first Masonic funeral, for Brother Harry Jacob of Logan Lodge No. 490, Altoona, Pennsylvania, at their request. In 1895, with a membership of 103, a balance due the Treasurer of $133.71 from the General Fund and a Permanent Fund, a large part of which had been borrowed for current purposes, the Lodge began the consideration of moving its location. The street cars of the city had been converted to electric power and many of the members began to move away from South Boston. Union Lodge had been meeting at Freemason's Hall at Fields Corner and moved to Upham's Corner in 1892. On December 11, 1895, being assured of a hearty welcome by Union Lodge, permission was received from Grand Lodge to move to Wheelock Hall, Upham's Corner. With the newspapers of the day featuring stories on the current Venezuela incident between Great Britain and the United States, and the Pope's offer to mediate; the fighting in Cuba between the insurrectionists and the Spanish; the 261st regular communication of Rabboni Lodge was held on January 16,1896, at Wheelock Hall, with Worshipful George A. Crawford in the East. Brother Tom Bond was probably receiving congratulations on the story which appeared in the morning paper that this old Boston ball player was to coach the Harvard nine for the current season. In the next six years, the membership of the Lodge increased over fifty per cent although finances continued to be troublesome and there were several occasions in which the Treasurer was obliged to advance his own funds to balance accounts temporarily. However, on November 15, 1900, the Charity Fund was established and the Treasurer had a balance in the General Fund as well. At our last annual meeting, the Charity Fund amounted to over $7,500.00. On April 17, 1902, with Worshipful Elnathan W. Haskell in the East, we met at the present apartments which we leased in connection with Union Lodge, St. Omer Commandery and Dorchester Chapter. The new apartments were dedicated to the uses of Freemasonry on December 11, 1902, by Most Worshipful Charles T. Gallagher and a large Suite of officers of the Grand Lodge. Here begins the more prosperous portion of the life of the Lodge. For the next 25 years the annual reports showed a steadily larger membership, and since 1904, the Treasurer has been able to devote his own funds to his own purposes. The first public installation of officers took place on January 10, 1908, with Worshipful Herbert M. Dodge as Installing Officer, assisted by Worshipful Benjamin S. Frost as Marshal. This was such an impressive ceremony and caused so much favorable comment that such installations have since been quite frequent. During the next ten years the Lodge was honored by several visits by Grand Masters and other distinguished guests. On December 21, 1911, a Treasurer's jewel was presented to Brother George H. Alexander on the occasion of the completion of twenty-five years of service as the faithful and efficient Treasurer of the Lodge. Most Worshipful Everett C. Benton, Grand Master, and Grand Marshal [http://masonicgenealogy.com/MediaWiki/index.php?title=MAGLGThacher George C. Thacher, Past Master of Rabboni Lodge, paid the Lodge an informal visit on June 19, 1913, and presented a gavel made of Cedar of Lebanon. The officers of Union Lodge raised a candidate on February 17, 1916. On that occasion the Master presented Union Lodge a gavel. This fraternal visit was returned on June 13th of the same year, and it was the pleasure of the Master to accept a beautiful gavel from Union Lodge. This fraternal exchange is typical of the pleasant relations we have enjoyed with the other Masonic bodies at the apartments, though space does not permit the recording of each incident. On many occasions we have joined with the other Masonic bodies in attending Divine Worship, and in recent years this has become an annual custom. Sixty members of our Lodge met the call to the colors occasioned by the outbreak of World War I and two made the supreme sacrifice for the country and ideals of their hearts. Our regular communication of October 17, 1918, was postponed until October 23rd because of conditions caused by the influenza epidemic which raged at that time. Honorable and Brother Joseph E. Warner, who was Speaker of the House of Representatives of the Massachusetts Legislature, was with us on December 18, 1919, on the occasion of the presentation of the State Flag to the Lodge. A careful search of our records and several telephone calls have failed to uncover the circumstances surrounding our acquisition of our National Emblem. If any Brother knows the circumstances, it should be reported to the Secretary in order that a note may be made of it in this brief historical digest. The Kosmos Club, composed of Masons in the Armed Forces, were our guests at our regular meeting October 21, 1920. It is the first time in the history of the Lodge that the meeting extended into the following day, as the Lodge was closed at 12:15 A.M. In 1921 the Lodge raised the largest number of candidates in its history. Eighty-nine men were raised by a line of officers which became accustomed to one or two special meetings every month. The first of a series of annual lobster dinners took place May 4,1921, and there were over 300 present to enjoy the dinner and the Minstrel Show which followed it. The name of Brother Ingvard N. P. Holm first appears on the visiting and service committee in January, 1921, and he has served continuously since that time. In recognition of his material contribution to the happiness and well being of our members, he was presented a Distinguished Service Medal on June 16, 1938. The first of a series of annual Old Timers' Nights was held December 21, 1922. Eleven members of the Lodge who had been in good standing twenty-five years or over were present. Annual Past Masters' Nights were inaugurated on March 20, 1924, with Worshipful Maurice J. O'Connell in the East. These have become regular annual events and are anticipated with much pleasure by Past Masters and members alike. Worshipful Brother Herbert M. Dodge has attended to arrangements for these affairs for almost twenty years. On November 15, 1925, the Building Fund was established and has grown to over $25,000 at our last annual meeting. A feature of the November, 1925, meeting was the presence of the Grand Master and the raising of a candidate by the Past District Deputy Grand Masters of the Fourth Masonic District. On the occasion of the annual meeting December 17, 1925, at which fifteen 25 year members were present, a new set of ofEcers' aprons was presented by Brother Henry Penn and a new Bible by Worshipful Ralph Lowe, Jr.
A unique occasion was the visit by Bredablick Lodge No. 880 of New York City on November 6, 1926. Our own Grand Master was also present to welcome our guests to Massachusetts. Our dinner was so well attended that we were obliged to use two banquet halls and 200 were unable to get into the lodge-room to see a candidate received on the Entered Apprentice Degree, with the work done in Swedish. Five hundred forty-nine did crowd into the lodge-room. In recognition of his devotion to the Lodge in the capacity of Chaplain, Right Worshipful David L. Martin was elected to honorary membership on September 18, 1930. He has served this Lodge as Chaplain continuously since September, 1927, and has endeared himself to the entire membership by his meticulous attention to all the duties of that office. The public installations of September 1932 and 1933 were unusually. well attended. Five hundred members, ladies and guests attended on September 21, 1932, and four hundred and fifty on September 27,1933. Entertainment consisted of dancing and refreshments. In recognition of the completion of twenty-five years' faithful and efficient service as Secretary, Brother Arthur W. Hunt was presented a special Secretary's gold jewel on May 18, 1933. Brother George H. Alexander was installed Treasurer on September 19,1935, for the 50th time. His term of office covered a period when the Lodge was located at its three different homes. He was well liked and all the members of the Lodge were anticipating the pleasure of celebrating the completion of fifty years' Service as Treasurer. He died on July 2, 1936, before that happy event was consummated. A special communication was held on September 10, 1936, for the purpose of tendering a reception to Right Worshipful Harold N. Rust, Grand Master of Masons in Pennsylvania, who was raised in Rabboni Lodge on January 8, 1895, when we were at Wheelock Hall and while he was a student at Massachusetts Institute of Technology. Most Worshipful Claude L. Allen, Grand Master of Massachusetts, was present to welcome Right Worshipful Brother Rust to Massachusetts. During the course of the evening, a hand engrossed certificate of Honorary Membership, enclosed in a leather portfolio, and an enlarged framed photograph copied from his portrait taken when he graduated from M.I.T., were presented to Right Worshipful Brother Rust, who stated that it was his intention to place the gifts and copies of our Lodge notices in the archives of the Grand Lodge of Pennsylvania. After his term as Grand Master of Pennsylvania, he served that Grand Lodge as Grand Secretary until his death on July 30, 1938. On the occasion of a reception to Right Worshipful. Ralph Lowe, Jr., Deputy Grand Master, on February 18, 1937, he was presented with an engrossed certificate of Honorary Membership, to which he had been elected the month before, in recognition of his illustrious service to our Lodge and to Masonry in general. Most Worshipful Claude L. Allen was present on that evening and received engrossed resolutions of esteem. He was proposed for Honorary Membership, to which he was elected the following month. The Life Membership Fund was established on April 21, 1938, by transferring from the Permanent Fund the total amount received during our history from life membership fees, $2,445.00, at which total it now stands. September 21, 1938, will long be remembered, not only because it was the occasion of the annual meeting of our Lodge, but also because of the tropical hurricane which visited us at that time. It did not, however, succeed in postponing the installation of officers, even though it did delay the proceedings until late, in the evening. Right Worshipful Harry C. Black was elected an Honorary Member on March 16, 1939. Preparations were first begun for the celebration of our 75th anniversary on September 19, 1940, by appropriating $150 from the General Fund. This was followed by appropriations of $225 on September 18, 1941, and $125 on September 17, 1942. A committee was appointed on November 21, 1940, to make the necessary arrangements for the celebration. In addition to appeals for assistance from members of our own Lodge, we have been happy to be able to contribute liberally to the sufferers from the Chicago and Chelsea conflagrations, Galveston disaster, Mississippi flood and such Grand Lodge projects as the Masonic Home and Hospital, the Grand Masters' Rainy Day Fund and the War Service Fund. Twenty-nine of our members have answered the call to the country's colors in the current World War. Our prayers for their safe return are with them always. Right Worshipful George C. Thacher also served as Grand Marshal and was elected Senior Grand Warden. Right Worshipful Ralph Lowe, Jr., has also been honored by the presentation of the Henry Price Medal, the highest award of the Grand Lodge. Fifty-five Masters have presided over the Lodge, twenty-seven of whom are still alive and members of the Lodge. Worshipful George A. Crawford, who now resides in California, is the Senior Past Master. He presided over the Lodge from 1894 to 1896. 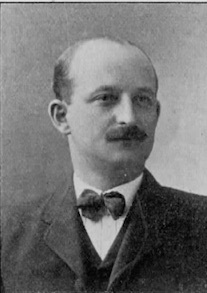 Worshipful Herbert M. Dodge, who served from 1898 to 1900, is next in line. ; R.W. Benjamin Pope, District Deputy Grand Master when Rabboni Lodge was formed and a charter member; Wor. Benjamin S. Frost, Master 1905 to 1906; and R.W. George C. Thacher, Master 1910 to 1911. One thousand two hundred twenty-seven members have signed our by-laws. At our annual meeting in 1893, we numbered 96. For the following thirty-three years the number increased each year until we reached 730 in December, 1926, when the pendulum swung in the other direction and the roll grew shorter each year until we now count 446 members. By Rt. Wor. Henry S. C. Cummings. An Anniversary of any worthwhile organization in the world today, carries with it great significance to our forbears, our institution and society of today — and to those who must carry our torch tomorrow. Such occasions are not only unusual and important for their conventional aspect, but in this day they are a most extraordinary event. Words such as these spoken 25 years ago by R.W. Ralph Lowe, Jr. become even more significant and meaningful as Rabboni Lodge stretches its past into the observance of its 100th Anniversary in 1969. I envy some of you who have been so long in Masonry, was how Rev. Bro. E. A. Horton, Grand Chaplain, viewed the importance of Freemasonry about the time this Lodge was getting established. Said he: "I am a great lover of surrounding circumstances. I can see dignity in it. I behold an education in it — not only for citizenship, but for many high attributes and possibilities of human character which serving, in some degree will enable me to gain a wider outlook on human nature. I can see the accent that you have always laid upon the merits of a man as a man ... of making this world more real; more sweet at its fountains; with a banner of humanity swinging over us as the great rallying insignia for us and for all men." Historians instinctively scan all sources open to them looking for unusual achievements, areas of special strength — but most of all for the contributions of individuals. In Masonry, in particular, there is an equal opportunity for all to make their talents available through the discipline of loyalty and service; through conformity to all that is good and true; through the practice of individual integrity — and through concern and responsibility towards others. From these, some inevitably emerge, grow in stature and achieve distinction for themselves while adding lustre to the record books. They are found among those who have served their Lodge as its Worshipful Master, their district as a District Deputy Grand Master — or through other unique ways merit the approbation of their brethren. So, we must honor most those who have carried 'the torch' highest — in response to the call for Divine Wisdom, moral strength and appreciation of the beauty of God's Universe. Previous histories of Rabboni Lodge have tried to lay emphasis on 'surrounding circumstances' that prevailed when fourteen members of Masonic Lodges in the vicinity of Boston came together to consider the formation of a new Lodge in South Boston. They had felt the urge, as had many other communities following the Civil War, for 'brethren to dwell together in unity'. They noted the transformation taking place industrially — destined to awaken a 'sleepy provincial town to its destiny as the commercial and financial center of New England'. During the decade between 1860 and 1870 when the steamships were landing over 20,000 immigrants on our docks each year, South Boston's population increased over 50% and the taxable value of property more than doubled. Besides the fishing industry, South Boston became known for its iron foundries, glass works, shipbuilding, lumber and lead works. Although three Lodges — Saint Paul's 1846, Gate of the Temple 1855, and Adelphi 1865 —offered 'light' to those searching for truth and faith and hope, the task of conferring degrees clearly indicated the need of an additional Lodge for this area. With the harmonious approval of these other Lodges, 20 petitioned for the formation of Rabboni Lodge — which was presented to the Grand Lodge December 28, 1868; granted January 11, 1869; and a Warrant signed by M. W. William Sewall Gardner, Grand Master, and R. W. Solon Thornton, Grand Secretary, was received from the hands of R. W. Benjamin Pope, D. D. G. M. of the 3rd Masonic District at the first Regular Communication of Rabboni Lodge while under dispensation. Thus, Rabboni Lodge was created — and on its way in serving God, Country and Humanity — with a proud record of dedication, motivation and conformity to Masonic teachings over the past century! Dispensations for new Lodges granted at the same time that Rabboni Lodge received its dispensation were: Charity, Globe, Upton, Mount Holyoke, Morning Sun, Mount Vernon (Belchertown), Phoenician, Puritan, Howard and Aconcagua (Chile) Lodges. The name 'Rabboni' is believed to stand for 'My Master' and was considered a title of honor. Meetings of Rabboni Lodge were held at the Masonic Temple in Boston from April 11, 1871 to May 14, 1872; in South Boston, May 14, 1873 to December 11, 1895; Wheelock Hall in Dorchester December 11, 1895 to April 17, 1902; and at Uphams Corner, Dorchester, from April 17, 1902 to this date. M. W. Charles T. Gallagher, Grand Master, was present when these apartments were dedicated December 11, 1902. Other Charter Members, in addition to the Officers installed, were R. W. Benjamin Pope, D. D. G. M., James F. G. Baxter, Bernard Jenney, Benjamin F. Smith, Charles Spofford, Joseph D. Elms, Daniel Briscoe, George B. James and Edwin Tilden. It was not until the Masonic Districts were reorganized by Grand Lodge in December of 1882 that Rabboni Lodge was lifted from the 3rd Masonic District and placed in the 4th Masonic District where it remains to this day. The first Official Visit to Rabboni Lodge was made October 11, 1870 by R. W. Benjamin Pope, D. D. G. M., a Charter Member, who showed in his report to Grand Lodge that "although small in numbers he found the Lodge in a prosperous and healthy condition." How vivid it is to a historian, as he scampers over the pages of history, shortening years into hours, to review the life spans of those who have influenced the achievements of the past. It seldom occurs to most of us that our lives are part of the pattern we are everyday weaving in life. The design at times is striking, dominant, vital — while at other times it seems quiet, even uneventful. To view the period of special strength is to watch personalities in their eagerness interpret life's quests, which Masonry so well elaborates. Some individuals so easily bring men together to seek the inspiration and harmony of fellowship; some deliver their ritual so sincerely and persuasively that the fullest beauty of the message of betterment is articulated — so that some lives, over others, grow in their stature almost indispensably — and when their presence is missing, we all feel life has lost a portion of its forward thrust. What stands out is the brevity of lives. No sooner does a life reach an unusual usefulness than it is suddenly reduced. Each of us portrays a spirit whatever it may be, as radiant as the fragrance of a blossom, which our record in life is a part. A history, such as we are reviewing for Rabboni Lodge, views the entry of a personality into the affairs of a community; follows the ascendancy of that spirit and talent and dedication; to the crowning moments of judgements by those who have been benefited — which for some the tribute searches for ways to keep ever fresh the memories worth most perpetuating. A page is turned and an admired friend we find has left our presence. Our inheritance enriched, we stand a little more erect and sure — that among us, will follow others as noble and aspiring spirits to brighten our day, to help us recognize the therapy that comes to us through faith and hope and charity. As in a relay race, the taper is passed from one to another — always in the hope that from the best that has been will follow something even better ahead. R .W. Benjamin Pope was certainly one of the greats of Rabboni Lodge. He never occupied an elective position. But as a Charter Member he was always interested in its work. He was District Deputy Grand Master 1869-1871 in the Masonic District which included the South Boston Lodges. He was until his death in 1879 the only Mason from South Boston to serve in this capacity. It was during these years that the Grand Lodge was struggling to reduce the large debt incurred in building the present Temple and such was the course pursued by R.W. Bro. Pope in making his official visits that many of the Lodges in the District came forward and commuted the Grand Lodge Tax, instead of waiting the 13 years that was allowed, thereby enabling the Grand Body to greatly reduce its debt. He received his Masonic Degrees in Gate of the Temple Lodge in 1856 and was immediately elected their Secretary. From that time till his death he was constantly in office and was honored with every Masonic position in the gift of the South Boston brotherhood to bestow. During his three years as Worshipful Master of Gate of the Temple Lodge his fame as an unusual, brilliant officer had then spread far and wide. The meetings were always crowded with visitors, who came from all parts of the state — such was the great interest he inspired. He served St. Matthew's R. A. Chapter as High Priest 1868-1873 and the same success that marked his administration in the Lodge, was carried into the Chapter — in which he was made an Honorary Member. He received his degrees in Boston Council RSM in 1864 and was knighted in Boston Commandery KT in 1865 but soon withdrew for the purpose of assisting in the formation of St. Omer Commandery in Dorchester of which he became a Charter Member and served as Eminent Commander 1875-1877. Such was the enthusiasm inspired here by him that it became noted as a Commandery — the best drilled and most prosperous in the whole jurisdiction that included Massachusetts and Rhode Island. He received the various degrees in Scottish Rite in 1862 and for 11 years was the presiding officer of Massachusetts Consistory — the Commander-in-Chief. He took unusual interest in this branch of Masonry and through his efforts was the means of making Massachusetts Consistory the largest Masonic Body in the world — turning it over to his successor with a membership of nearly one thousand. In 1866 he was honored by being elected by the Supreme Council as an Honorary Member Thirty-Third Degree. The records read: "Not only does this Lodge mourn his loss but so does every Masonic Body in South Boston — for his usefulness was not confined to any single Body. It was a service that benefited all and entitles his memory to unusual consideration and respect. We will ever cherish his memory as a true Man and Mason." R.W. Benjamin Pope once said: "Whatever had been accomplished by him he always considered a labor of love and looked for no other regard than the consciousness of having performed in as faithful a manner as he knew how, the duties that it had been his pleasure to perform." George Sprague Carpenter was a Charter Member and served as Secretary of Rabboni Lodge 1870-1880 during the first ten years of the Lodge. He received his Masonic Degrees in Adelphi Lodge in 1867; held membership in St. Matthews R. A. Chapter 1868 till 1901 when he affiliated with St. Pauls R. A. Chapter. He joined Boston Council RSM in 1900; DeMolay Commandery KT #7 in 1880; and the Scottish Rite Bodies in the Valley of Boston. He served in all offices of Lafayette Lodge of Perfection, except the Thrice Potent Master; served as Sovereign Prince of Giles F. Yates Council, Princes of Jerusalem 1879-188S; and his membership dated from 1868 in Gourgas Chapter of Rose Croix; and DeWitt Clinton Consistory from 1869. He was created a Sovereign Grand Inspector-General 33° (Honorary) in 1886. He de-mitted from Rabboni Lodge in 1882 and was admitted to membership in Columbian Lodge, Boston. Except for the very first meeting (January 13, 1869) notices were thereafter printed. These notices showed that sodalities were held every Wednesday evening, so anxious were the officers to perfect their ritualistic work. The printing style of those days printed the hour as 7V2 o'clock, not 7:30 P.M.; and when it was time to call for the assessments, the word 'quarterages' was shown on the notices as being due. When the members planned to discuss Masonic affairs they indicated that a 'symposium' would be held after the work. The record of Wor. Richard M. Barker, who was beloved and affectionately esteemed by all who knew him, not only was important to Rabboni Lodge as its 'first' Worshipful Master — but his extraordinary talents in leadership made his contribution to the whole structure of Masonry unique — if not important historically. He received his Masonic Degrees in St. John's Lodge, being initiated November 1, 1847. He took an active interest in Boston Lodges of Instruction, when the beauty and importance of good and correct work was just beginning to be recognized. This acquaintance among brethren of his own age led him to more fully and permanently identify himself with the Fraternity in South Boston, and in particular in securing dispensation for Gate of the Temple Lodge over which he served as Worshipful Master 1856-1857 and was made an Honorary Member. The records read: "None but those of us who remember our departed brother in these days of his manhood's prime and beauty can form any adequate idea of the dignity of his presence, the impressiveness of his manner and the ability with which he performed the duties of his office. He later gave the benefit of his energy and experience in obtaining a dispensation for Rabboni Lodge in 1869; and served as Worshipful Master during the year commencing January 11, 1870. He held membership in St. Paul's R. A. Chapter — serving as Excellent King in 1867. He was a founder of St. Matthews R. A. Chapter, serving as Captain of the Host in 1863 — and later was made an Honorary Member. He joined Boston Council RSM in 1854; was knighted in Boston Commandery No. 2 KT in 1854. Perhaps the most interesting part of the Masonic Record of Wor. Richard M. Barker relates to his relationship to the Scottish Rite Degrees, which he received in 1862. For his part in petitioning in the formation of Lafayette Lodge of Perfection, Giles F. Yates Council, Princes of Jerusalem; Gourgas Chapter of Rose Croix; and the DeWitt Clinton Consistory — he was created a Deputy Grand Inspector General 33° of the Supreme Council on November 21, 1862; and an Active Member of the Supreme Council on December 13, 1866. He was made an Honorary Member of each of these Bodies, as well as being elected Treasurer in 1869; continuing as Treasurer of DeWitt Clinton Consistory until that Body united with Massachusetts and Boston Consistories February 15, 1871. He continued as Treasurer of Gourgas Chapter of Rose Croix until that Body united with Mount Olivet Chapter of Rose Croix April 28, 1871; and continuing, remained Treasurer of the other Bodies until December 1, 1874 when he was elected Sovereign Prince of Giles F. Yates Council, P of J — a position held by him at the time of his decease. It was said of Barker that he had good sound common sense; was fearless in the expression of his views; whose experience and judgement told him intuitively what was proper to do in every emergency; one who possessed that magnetic power that drew other men to him; one who was a leader among men — able to keep the wheels of business moving; and was able to dissuade the frivolous from consuming time in useless and ill advised measures. He had the power of speaking direct to the heart and minds of men with words that appealed at once to their judgement. The importance of this tale is that in 1861 an unfortunate schism took place between two Supreme Councils, each claiming to be legitimate and asking for the recognition of the Masonic world. It affected all the Masonic Bodies throughout the Northern States. Those who composed those rival councils were men of standing in this and other States. They occupied positions in various Grand Bodies, Grand Encampments, Grand Royal Arch Chapters and Grand Lodges. The Van Rensselaer Supreme Council, as it was familiarly called, had the prestige of having its headquarters, or its Grand East, at the home of the Grand Lodge of Masons in Massachusetts. Enlisted among them were many of the Officers and Permanent Members of the Grand Lodge — their power and influence was wielded with a vigorous hand. The Raymond Council established its headquarters at Nassau Hall in Boston. It enjoyed the prestige of having the legitimate Commander and Deputy at its head, with the disadvantage of having it known that it was his arbitrary conduct which created the dissension which caused the schism. The brethren who composed this Raymond Council were some of them men advanced in years and unable to make head against the active measures adopted by those of the opposing faction. They wanted a man who was popular in the Fraternity; one who had the power of drawing the right men about him; a man of energy, fertile in resources; fearless in action. This man turned out to be Richard M. Barker. He was the man they enlisted in their service — for as vague was the cause of the quarrel the other side might as well have obtained him. They gave him the Thirty-Second Degree and then the Thirty-Third Degree — and Brother Barker started on his work. As an organizer, a drawer together of men, he was preeminently qualified. He drew men around him whom he knew to be qualified for presiding officers; men who could work Masonic Bodies efficiently and it was not long before four Bodies of the Scottish Rite were doing a thriving business at Nassau Hall. All this allusion to a past and buried quarrel is to exemplify the power, the perseverance, the aggressiveness of this man. After a few years of strife, more peaceful counsel prevailed and the two contending Bodies united — and in no branch of Freemasonry are the Bodies more harmonious or prosperous. Brother Barker found himself as much honored by those who had been opposed to him in being placed in position of honor and trust — as he was by those with whom he had always labored. His position and strong opposition had won the respect of his opponents. He is to be best remembered for his social qualities; his sincerity and open heartedness; his eminent services to the Masonic Fraternity. Even in schisms — his stature outshone the divisiveness that perplexed so many, for through it all, his ruling spirit in the end restored both harmony and unity for all. In the original set of By-Laws it was intended that the membership should never exceed one hundred. However, as the membership approached this total this limitation was deleted. It was at the June 9, 1885 meeting that the Life Membership Fund was established and #240.00 paid into the Fund, representing six who had paid $40.00 each for this privilege. The first reference to assessable membership appeared in the annual report in 1886, although its significance became apparent later. When it became necessary to refurnish the Lodge Apartments in 1891, Rev. Bro. Fred H. Allen generously volunteered his services by giving a steriopticon Lecture in which he described Noted Cathedrals of the World which materially helped Rabboni with its share of expense for the repainting, recarpet-ing and acquisition of new settee chairs. Rabboni Lodge was visited by many distinguished Masons during the early years. On March 9, 1870 M. W. William Sewell Gardner, the Grand Master, was received. On April 8, 1873 the Lodge was host to M. W. Sereno D. Nickerson, the Grand Master. M. W. Thomas Walker, Grand Master of New Brunswick, visited on May 8, 1894. It was in this period of time that Rabboni Lodge on May 14, 1889 elected to Honorary Membership: Wor. George W. Kingman and Wor. Theodore L. Kelly (Gate of the Temple Lodge). During the first twenty-five years the Lodge had three Secretaries: Bro. George S. Carpenter 1869-1879; Bro Henry C. Mitchell 1879-1890; and Bro. Richard T. Williams 1890-1896. The penmanship of Bro. Williams was truly exquisite — a joy to behold. The records sometimes contained matters of general interest, as in the instance the death of James A. Garfield, the President of the United States on Sept. 19, 1881; and the proclamation of M. W. Harvey N. Shepard, Grand Master, concerning the death on Sept. 12, 1893 of M. W. Richard Briggs while Grand Master of Masons in the State. Not since the death of John Rowe in 1787, Grand Master of St. John's Grand Lodge, had a Grand Master died while serving as a Grand Master. Rev. Bro. James Huxtable's relationship to Rabboni Lodge was interesting reading, for he received dispensation from Grand Lodge that enable him to be elected on the same day that he also received his entered apprentice and fellow craft degrees (May 10, 1892). Eventually he was raised as a Master Mason on June 14, 1892 and installed on October 11, 1892 as Chaplain of Rabboni Lodge. He so endeared himself to the Lodge during his 26 years as Chaplain (1892-1906 and 1908-1919) that he was elected an Honorary Member February 21, 1918. He was Chaplain Emeritus at his death on September 13, 1929. Rabboni Lodge mourned the death of Bro. John Q. A. Holbrook. He was a late member of the Gate of the Temple Lodge, but for 17 years (1858-1875) had served as its Tyler. The fact that the grandson of Paul Revere, William B. Revere, belonged to Rabboni Lodge, brings to mind an article appearing in the Christian Science Monitor Jan. 23, 1915 concerning the laying of the cornerstone of the State House in 1795 by Paul Revere — which still — a hundred years later — was the prevailing Masonic sentiment of the second 25-year period in the history of Rabboni Lodge. In substance he said: These are suspicious days when the Arts and Sciences are establishing themselves in this happy Country — Country distinguished from the rest of the world by being a government of laws; where liberty has found a safe and secure abode; and where her sons are determined to support and protect her. May we, my Brethren — he said — so square our actions through life as to show the world of mankind that we mean to live within the compass of good citizenship and that we wish to stand upon a level with them. The motive that prompted Paul Revere to become a Mason was the same that actuates every man who seeks a knowledge of Masonic mysteries properly, that is, a constructive desire to perfect himself in manly virtues and to find a field for the exercise of the fraternal instinct. During these happier days the Fraternity had few of the problems we endure today. The climate of thinking was constructive, reaching and unharrased by questionings. From one who spoke at a Rabboni Meeting, the records quoted the speaker as saying: "There is nothing shallow about Masonry. It is fitted to man's everyday needs. It is a 20th Century gift from antiquity. There is great strength in its principles. One lesson it teaches is to uphold the right." This Masonry continues to teach. Its influence has shed its light into lives for generations and will always be the substance for hope for a better world in which to live. Great gains in membership came about between 1894-1919. Actually the growth increased five fold, from a membership of 100 to 515. Following the recommendation of Wor. Benjamin A. Ham, the Lodge saw a greater need for transferring its activities to the Dorchester area from South Boston. A petition to permit this change was granted by Grand Lodge December 13, 1895 and carried out during the administration of Wor. George A. Crawford. It was in 1897 that the fee for Life Membership was increased from $40 to $75. In 1900 the Annual Meeting was changed from October to December. In this same year a Charity Fund was created. The salary of the Secretary in 1901 was increased from $50 to $100; which in 1917 was fixed at $225 as a result of a study of the eleven Lodges in the 4th Masonic District. At that time the per capita range for these Lodges for the Secretary's salary ranged from 130 to 700 and it was found that Rabboni Lodge was the lowest. Wor. Bro. Ham was the one who originally proposed in 1907 to relieve from paying dues any who had paid the same for 25 years saw his motion carried March 21, 1918 and has only recently been removed. It created a dilemma as the inflow of new members slackened and cost of all services kept rising to find half of the membership exempted from meeting these expenses. Month after month the records showed guests of prominence as visitors of Rabboni Lodge. M. W. John Albert Blake, Grand Master, visited March 15, 1906 and again three times in 1908. M. W. Dana J. Flanders, Grand Master, visited April 12, 1911; M.W. Everett C. Benton, Grand Master, was received on June 19, 1913. Others honoring Rabboni Lodge by their presence included: M. W. Lee S. Tillotson, Grand Master of Vermont (June 18, 1908); M.W. Charles F. Painter, Grand Master of Colorado (Oct: 20, 1910); M. W. Melvin M. Johnson, Grand Master, (May 18, 1916). When M.W. Everett C. Benton visited June 19, 1913 he presented Rabboni Lodge with a Gavel made of cedar from the Forest of Mt. Lebanon, made from was of sterling integrity, unswerving loyalty and unselfish devotion to Freemasonry. He earned the confidence of the Craft and achieved many honors. He loved Masonry for what was best and highest in its teachings. He was a true friend, a just and upright man, and his memory will ever be cherished by those who were his friends and knew him intimately. Had he lived he might well have been numbered among those to have received the Thirty-Third Degree. He died November 10, 1925. R. W. George C. Thacher was the third Rabboni Lodge member singularly honored during these early years. He served as Grand Marshal of Grand Lodge 1912-1913 by appointment of M. W. Everett C. Benton, Grand Master; was Senior Grand Warden of the Grand Lodge in 1915; and was the recipient of the Henry Price Medal and became a Permanent Member of Grand Lodge in that same year. In 1914 he became Commander-in-Chief of Massachusetts Consistory and in 1915 was honored by the Supreme Council 33° by being crowned an Honorary Thirty-Third Degree member. Rabboni Lodge elected him an Honorary Member on June 21, 1917 and his death occurred August 8, 1917. The Memorial to R. W. George C. Thacher said of him: "Appreciative of his sturdy manhood and his untinted contribution of time and ability to every branch of Masonry this Lodge would put on record a well earned tribute to his memory. He was strong of will, hale, hearty and genuine. He was resourceful, straight forward and honest. Whatever the task assigned to him it was faithfully performed. Outside of his home and his business there was nothing else so attractive to him as the fraternity of Freemasonry; and it was within its circle that he found the most of his associates and spent most of his time during his later years. He possessed in a marked degree a most unusual combination of gifts which especially fitted him for recognition and rapid advance in office. First of all he was a delightful brother. He met men of all types with affability and entered widely varying groups with a spirit and bearing that won their confidence and regard. Furthermore his executive ability was of an exceptional type and he managed large and intricate affairs with ease and efficiency; while as a ritualist he was at the same time, ready and correct of memory and efficient in its rendition. Behind and directing his genius and work was a great bighearted manly man whom we delighted to honor. He served as Master of Rabboni Lodge in 1907; was exalted in St. Pauls RA Chapter in 1902 and was its High Priest in 1912. He was a member of Boston Council RSM 1902; and its Illustrious Master in 1909. He was knighted in St. Bernard Commandery in 190S and was its Eminent Commander in 1911. In Grand RA Chapter he was Captain of the Host 1914-1915 and Deputy Grand High Priest 1916. He was Deputy Grand Master of the Grand Council RSM in 1912; and in addition to being an Honorary Member of Rabboni Lodge (April 1919) received this same honor from Corner Stone Lodge, Duxbury; Pythagorean Lodge, Marion; Shawmut Lodge, Boston; Wareham RA Chapter and Cambridge Councils, RSM." The Memorial concluded with these lines: "With the certainty of Immortality, which has been characteristic of Masonry from its earliest days, we look forward with fixed faith to the glad hour when we shall meet with him again in the unbroken reunion of the Grand Lodge in Heaven." Tomorrow is not thine; improve today." The rumblings of World War I cast their shadow on the life of our times 1917-1918, although victorious from the American point-of-view, proved but a foretaste of the difficulties facing all of mankind in the difficult task of living together as friends and brothers. Wars have scourged the horizons of generations and may blotch many tomorrows — but in our Masonic thinking we dream of the brotherhood of man under the Fatherhood of God. Our constant prayer is that we ever 'meet upon the level and part upon the square' in peace and love and unity. Rabboni Lodge welcomed home its men who had been in military service at a meeting held on December 18, 1919. 31 out of 58 were present. Bro. John J. Holub and Bro. George D. Washburn paid the supreme sacrifice. From among these veterans only Louis H. Mahn served Rabboni Lodge as one of its officers — having presided as Worshipful Master 1949-1950. There were several other Rabboni Lodge members elected to Honorary Membership; R. W. William H. L. Odell, who was elected March 15, 1917; Rev. Bro. James Huxtable, February 21, 1918; and Wor. Albert H. White on January 21, 1921. These names are in addition to Wor. Theodore L. Kelley, R. W. George C. Thacher and R. W. George T. Wiley ... The year 1908 will go down in the records as a busy year, when it is considered that the Lodge received 52 applications for the degrees and actually added 43 to the membership roles. Following the War Year in 1920, the Lodge added fifty members. This burst of activity required the calling of 28 special meetings. Unlike today's meetings, almost every meeting held during 1908 brought out in excess of 300 in attendance. For instance, 325 attended a Legislative Night on May 16, 1908 — at which time 34 attended from the Legislature, including Bro. John N. Cole, the House Speaker, and the Hon. & Bro. George A. Hibbard, the Mayor of Boston. Some 335 attended the Official Visitation of R.W. Fred C. Garvin, D. D. G. M. Masons always enjoyed coming to Rabboni Lodge. They felt rewarded and enriched — a spirit that has always pervaded each of its meetings. A situation developed at a meeting held on November 21, 1912 which reminded us of the days when tailors were more in abundance than now. It seems that Bro. Charles Mintz had his overcoat taken from the coat room by mistake. The Lodge voted that this member be "instructed to go to any tailor in Boston and order a new overcoat and have the bill sent to Rabboni Lodge." Rabboni Lodge had three Secretaries between 1894-1919, viz: Wor. Charles T. Wood who served from 1896 to 1900; Bro. 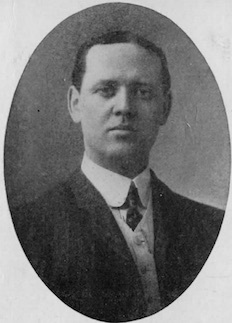 Frank B. Crane, 1900-1907; and Bro. Arthur W. Hunt whose service was between 1907-1935. In order to understand a little better the Masonic climate at the beginning of the third quarter of existence of Rabboni Lodge in 1919, we found these words in the Grand Lodge Proceedings by M. W. Leon M. Abbott, the Grand Master: "It is coming to be more and more generally recognized that constant contemplation of the lives and the achievements of those who have done much to make our country great and prosperous and happy helps to bring our own thoughts up to a higher and better level; and enables us to contribute more generously to that end for others, not only for our day and generation, but for those that shall come after. Whatever helps to bring out the best there is in us helps to bring out the best there is in other men — and it has been truly said that but for great men, we common folk could scarcely keep our souls alive." These remarks related more specifically to the observance of George Washington's birthday — but, as with the history of Rabboni Lodge, the men who have helped the Lodge grow as an influence for good in the lives of others is of the substance that keeps our own souls alive. As we started searching the records for the period between 1919-1944 we ran across an interesting item. For the first time in the history of Rabboni Lodge a Communication was carried over into the next day. The Lodge closed at 12:15 A. M. on the midnight of October 22, AL 1920. The business of the day before, called for the election of 14 candidates; adoption of changes in the By-Laws; the reading of 11 new applications for degrees; the presentation of the Fellow Craft Degree to four candidates; a speaking program and an unusually good musical at the dinner. The Lodge was opened at 6 P.M. on Oct. 21st with Wor. Osman A. Wells presiding. At the 1920 Annual Meeting Bro. Arthur W. Hunt, Secretary, indicated that during the preceding year the Lodge had received 99 applications for the degrees, making it the greatest year in the history of Rabboni Lodge. This, he said, had involved much extra work, especially in the appointment of investigating committees — and he expressed his thanks to the brethren for the willing help they had given to him. Notwithstanding the numbers it was his opinion that the quality of the candidates had compared very favorably with those of other years. The dramatic jump from 515 in 1919 to a membership in Rabboni Lodge of 730 in 1926 — and to a peak in the 'assessable' membership of 665 — followed closely the happenings to Masonry following the end of World War I when during these years more than 65,000 flocked into the fraternity. Many of us will never forget the depression years 1929-1943 which was a nightmare period for all organizations, including Freemasonry. Our ranks in almost every branch of the fraternity were literally cut in half. Candidates became so scarce that it seemed our prospects for the future were very dire. However, at the end of this great drought, Rabboni Lodge still had 445 members and income from 246 assessable members — which showed a decline of 37%, slightly better than was the general experience everywhere else. A significant milestone was reached when Bro. George H. Alexander was installed for the Fiftieth consecutive year (1886-1936) as Treasurer of Rabboni Lodge. The occasion brought out 350 for the Installation Ceremonies. He soon after became ill and died July 2, 1936. Reference to this unusual record was placed in this section of the history because the final end of his service touched into it, although his influence extended back to the date of the founding of Rabboni Lodge. The record was becoming noteworthy thirteen years earlier (1923) when a 'Citation' was spread on the Records of the Lodge, which said: "This unusual term spreads over nearly three quarters of the entire life of our Lodge and has been associated with 25 Worshipful Masters. The present gratifying condition of Rabboni Lodge warrants the hope and expectation he will continue long beyond the present generation the true exponent of the Principles of our Order. The purpose of enlightenment and for the knowledge of our successors this testimony of our esteem recites the fact that to him in a very large measure, we are indebted for the continued possession of our Charter. Be it remembered that in early days of stress and storm, Bro. Alexander, expressing the same affection for the Lodge as we bear witness these many years, voluntarily from his own resources supplied the funds enabling Rabboni Lodge to continue its glorious work. Not only hereby demonstrating our deep gratitude for these acts and the 37 years active duties as Treasurer, we hope with continuance of health and the happy disposition so manifest, he may continue in the office and secure for himself and Rabboni Lodge, the distinction of crossing the world's record for length of Masonic Service." Mention has been made of the gratifying condition of Rabboni Lodge. When one reviews the records and sees the dates when the Permanent Fund first came into existence, followed by the Building Fund, the Charity Fund, the Life Membership Fund — and then has the privilege of seeing their present value, both cost price and market value — one is given a lesson in the value of building well for the future of one's resources. It Would serve no particular good to reveal exact figures on these pages, but there is assured stability indicated behind the name of Rabboni Lodge; there is, in addition to the teachings of the Craft — values to treasure and protect, not for this day in which we live, but for the enrichment of many tomorrows. Indeed, Rabboni Lodge shows from the past that it intends to hand along to others the rich inheritance that has come from the foresight, industry and enthusiasm of its own. The occasion held in honor of M. W. Harold N. Rust, the Grand Master of Masons in Pennsylvania on September 10, 1936 was perhaps the most important meeting ever arranged by Rabboni Lodge. It was unusual because this honored guest had been made a Mason in Rabboni Lodge some forty years before (Nov. 13, 1894). When he found that he was to move to Pennsylvania in 1896 where he would permanently reside he took a demit from Rabboni, never anticipating what the future might hold for him in this neighboring jurisdiction. He was given the opportunity in Pennsylvania to advance through the chairs of the Blue Lodge and Grand Lodge till in 1936 he became their Grand Master. The reception tendered this distinguished Mason broke all precedents and normal procedures. By dispensation of the Grand Master, Rabboni Lodge was permitted to elect him an Honorary Member practically on sight (June 18, 1936). M.W. Claude L. Allen, Grand Master, headed the Grand Lodge delegation to receive R.W. Harold N. Rust in Rabboni Lodge, with such prominent members of the Craft as: Joseph Earl Perry, Edwin O. Childs, Arthur D. Prince, Herbert P. Bagley, Albert A. Schaefer, Robert J. McKechnie, Frederick W. Hamilton, Frederic L. Putnam, Herbert W. Dean, Louis A. Jones, Frank H. Hilton, as well as many others — to honor the Masonic career of this former Massachusetts Mason. A framed certificate of Honorary Membership was presented to this honored guest. R. W. Ralph Lowe, Jr. was Chairman of the Reception Committee, and included 22 of the Past Masters of Rabboni Lodge. It was an evening long to be remembered by those who attended, including also your Historian; and was a tremendous tribute of esteem in which the Grand Master of Pennsylvania was held. He also was a recipient of the Henry Price Medal in 1936 when he appeared at a Quarterly Meeting of Grand Lodge. Following his term as Grand Master, he became Grand Secretary until his death July 30, 1938. In the ranks of Rabboni Lodge were many devoted and distinguished Masons. One of these was Wor. Benjamin S. Frost, whose life work was in the catering and hotel business. He received his degrees in Rabboni Lodge in 1899; served as Master in 1905-1906; was Senior Grand Steward of the Grand Lodge in 1909. He was exalted in Dorchester RA Chapter; greeted in Boston Council RSM; and knighted in St. Bernard Commandery #12 KT. He received the Scottish Rite Degrees in the Valley of Boston; and served as Most Wise Master of Mt. Olivet Chapter of Rose Croix 1913-1916; and honored by the Supreme Council 33° by being created a Sovereign Grand Inspector General, 33° Honorary Member in 1915. He served in 1914 as Standard Bearer for the Massachusetts Council of Deliberation. As Most Wise Master, and as Orator of the Chapter for a number of years after his term as Master his ritualistic work was especially outstanding. To listen to his accurate ritual rendered with deep appreciation of its significance in a superbly resonant and sympathetic voice, was to be impressed with his sincerity. Modest, friendly, deeply religious; helpful, a good companion and typically mine host in his contacts with the public — he was held in universal esteem. He died while a resident at the Masonic Home in Charlton in 1943. R.W. Ralph Lowe, Jr. has added strength and prestige to every facet in the life of Rabboni Lodge. From the day he was appointed as an officer in the line, to this day, his influence, leadership and contacts have enabled Rabboni Lodge to continue over the past twenty-five years especially the high quality of dedication and spirit and service evidenced in the record of those who had come before him. As the Master of Rabboni Lodge in 1924-1925 one can glean from the records his keen observations and concern for its welfare, and the part a Lodge should play in giving enlightenment to its members. Upon completion of his term as Master, the following penetrating and challenging reflections of the aspirations of all Lodges and all Masters in their labors to inspire the general membership to greater dedication, had this to say: "We are a large Institution and in many respects function in a large way over a large area. No man can take unto himself credit for that which he could not possibly accomplish individually. Cooperation, exchange of ideas, assistance of a mutual character, helpfulness in a very general way must be rendered by those who make up the personnel of a Masonic Lodge. Without all of these in abundant measure no Master can succeed and serve his Lodge well. Personally, I am convinced by my individual experience of the past year that whatever progress we have made is not individual unto any one, but collective unto us all. In retrospect, it is only natural to think of Rabboni Lodge as an important unit in our great Fraternity. Has it ritualistically fulfilled its obligations in the past year? Have we gained in reputation because of our social activities? Is the numerical strength of our body what it should be? Are we sound financially? It is, indeed, a most pleasant duty to report to you that in the above four phases of the life of our Lodge — and they cover them all — that Rabboni Lodge proportionally speaking, is second to no Lodge within the Jurisdiction of the Grand Lodge of Massachusetts. There may be some Lodges that are stronger financially; may be there is one or more greater numerically. Perhaps some Lodge might be singled out as on a parity with us in ritual work. Yes, some might be able to place beside us a Lodge of equal reputation in its social activities — but, I challenge anyone to name a Lodge with any better standing, or with any larger reputation, collectively in social, numerical, ritualistic or financial strength within the confines of our Grand Lodge." In Grand Lodge affairs R. W. Ralph Lowe, Jr. was appointed District Deputy Grand Master of the 4th Masonic District by M.W. Frank L. Simpson 1927-1928. His popularity was evidenced by the sizeable suites which accompanied him in the performance of these duties. In 1937 he was further honored by Grand Lodge in receiving the highest appointive position among the Grand Lodge Officers that any Mason might receive. M. W. Claude L. Allen, Grand Master, appointed him as the Deputy Grand Master. This made him a Permanent Member of Grand Lodge, in which august body that numbers only 71 members, he ranks in seniority behind Stephen C. Luce, Jr., Walter B. Chase, Rutherford E. Smith and Joseph Earl Perry. The Reception given to R.W. Ralph Lowe, Jr. in 1937 was attended by a most flattering delegation of Grand Lodge Officers, past and present, headed by the Grand Master, who at that occasion made a presentation of an exquisite wrought gold jewel, befitting his rank of Deputy Grand Master and an engrossed framed certificate of Honorary Membership. He was the recipient of the Henry Price Medal also in 1937. R. W. Ralph Lowe, Jr. has been an important leader in Masonic affairs. He was High Priest of Dorchester RA Chapter 1925-1926. Grand Steward 1927 and Grand Scribe 1930 and Grand High Priest of the Grand Royal Arch Chapter of Massachusetts 1934-1936. He is the senior living Past Grand High Priest. As the Grand High Priest he was the first to make Quarterly Reports to the Grand RA Chapter; and the first to designate 'Right Eminent' as a permanent title for those who have served as Deputies for the Grand RA Chapter. He served on the Grand Lodge Board of Education for 11 years (1933-1942) as Director 1933-1934; and later as Associate Director. It was in this period that Grand Lodge established Lodges of Instruction and made it a requirement for those coming into the Fraternity. He addressed the Grand Master's Conference in Washington, D. C. at the request of M. W. Curtis Chipman concerning the experience of our Grand Lodge in establishing Lodges of Instruction. It should be recorded also that it was through the initiative of R. W. Ralph Lowe, Jr. that Crusader Chapter, Order of DeMolay, owes its start. It was a resolution he offered on November 24, 1924 that Dorchester RA Chapter sponsor this DeMolay Chapter, that was instituted March 30, 1925. As Chairman of the Advisory Committee he was able to raise $1,600 to finance the project. On the night of its institution there were 206 candidates initiated (a record for the State) and present for this ceremony was M.W. Melvin M. Johnson, Past Grand Master and Deputy for DeMolay in Massachusetts. Up till then there were only 12 DeMolay Chapters in the State compared to the number today — which is close to 100. R. W. Ralph Lowe, Jr. is the Senior Past President of the Massachusetts Convocation of High Priests (1937); and for many years he was a member of the Grand RA Chapter Exemplification Team. It was in 1957 that he was presented his Veteran's Medal by Grand Lodge for having been in the Fraternity for fifty years. Just as Rabboni Lodge respected the fifty years of service of Bro. George H. Alexander — so does the Lodge view with pride a similar length of Masonic Service of R. W. Ralph Lowe, Jr. which, between these two members, has embraced the entire 100 years existence of our Lodge. This is an altogether most unique record. R. W. Harry C. Black, who was an Honorary Member, (elected March 16, 1939) served as Master of Rabboni Lodge 1926-1928. He was appointed by M. W. Claude L. Allen as District Deputy Grand Master of the Dorchester 4th Masonic District 1937-1938. He succeeded Bro. George A. Alexander as Treasurer of Rabboni Lodge, serving from 1936 to 1945. He had the honor of being the Historian when Rabboni observed its 75th Anniversary. It was during the administration of this brother that automatic life membership for members paying dues for 25 years was lifted. The History you are now reading might well have been written by R. W. Harry C. Black, had he not died on April 7, 1967—for he was often the one to reminisce about the past of Rabboni Lodge. The 75th Anniversary of Rabboni Lodge was observed by a Church Service on April 16, 1944 at the Pilgrim Congregational Church at Upham's Corner, Dorchester, and at the Masonic Temple on April 20, 1944. At the Church Service seated on the platform were many distinguished guests, including R. W. Raymond C. Warmington, Past Deputy Grand Master. R. W. David L. Martin, Chaplain of Rabboni Lodge, and the presiding District Deputy Grand Master, delivered an address on the "Purpose of Masonry." His development of the subject was such that it was evident to all present that Masonry had always taken a vital part in the furtherance of the 'brotherhood of man' and was destined to occupy a still more important post when peace throughout the world becomes an assured fact. The Anniversary Observation at the Masonic Temple on April 20, 1944 was a most memorable evening. At the banquet the special guest was Bro. Jarvis Hunt, President of the Massachusetts Senate, while at the meeting that followed was M. W. Arthur W. Coolidge, Grand Master, accompanied by a distinguished suite of Grand Lodge Officers. It was at this occasion that R. W. Harry C. Black presented a most interesting history of Rabboni Lodge during the past 75 years, which elicited a well deserved applause from the 170 members of the Craft present. R.W. Ralph Lowe, Jr. was Chairman of the Reception Committee, with 18 of the Past Masters of Rabboni Lodge present, to welcome the Grand Master. The story of R. W. and Rev. David L. Martin is another interesting part of the history of Rabboni Lodge. He was a Western Pennsylvania boy, one of a family of 12 children, in a modest humble Christian home. He went to a country school four months a year; attended Grove City College; became a teacher at the age of 17. He held a pastorate at Townsend, Massachusetts; went to preach in California and returned to the East in 1902; and secured a Degree in Philosophy. He was Pastor of the First Congregational Church in Squantum 1935-1945. He founded the first Chinese Sunday School in Boston in 1904; and started a Bible Class in 1912 to teach Bible reading to children. This became national in scope and he became the first President of this Movement. He was a World War I Major in the Army Medical Corps. He became Master of Rabboni Lodge in 1940; was appointed by M. W. Joseph E. Perry as District Deputy Grand Master of the Dorchester 4th Masonic District 1943-1944; and appointed by M.W. Albert A. Schaefer as the Grand Representative of the Grand Lodge of Mexico, (Nuevo Leon) near the Grand Lodge of Massachusetts in 1945. He held membership in Scottish Rite, the Shrine and Eastern Star. On the Official Visitation of R. W. Louis J. Roazen on November 15, 1945 the Joseph Warren Medal, presented by Grand Lodge for 'distinguished service to Masonry' was presented to R. W. and Rev. David L. Martin. It was sad to read in the records that he died on December 6th — hardly three weeks later. It was said of him that his actions, integrity, generosity and courage displayed at all times, discharging the trusts and confidences imposed in him, gained the esteem of all who knew him. He contributed toward the building of Masonry, through the years, far beyond the knowledge of most of us and for this good and faithful Mason, Rabboni Lodge will always be deeply indebted. He was Chaplain of Rabboni Lodge 1927-1930 and elected an Honorary Member on September 18, 1930. Rabboni Lodge has been host to many presiding Grand Masters over the years. In the period between 1919-1944 M.W. Frank L. Simpson visited in 1926. Perhaps because of the great honor to Rabboni Lodge that R.W. Ralph Lowe, Jr. had been selected by M.W. Claude L. Allen as the Deputy Grand Master the Lodge delighted to confer Honorary Membership on this Grand Master on March 18, 1937. This honor could not have been conferred on anyone in the Craft anymore distinguished. He was Grand Master of Masons in Massachusetts 1935-1937; Active Member of the Supreme Council 1940-1960 and Deputy for Massachusetts for 12 years, during which years Scottish Rite enjoyed its greatest growth. Bro. Ingvard N. P. Holm never filled a position in the line of officers but he endeared himself to the membership by his 'never failing attention to the shut-ins of Rabboni Lodge'. He received public commendation of Wor. Maxwell B. Lowman at the December 1946 meeting of the Lodge; and by Wor. Louis Kimpel in 1951. The latter proposed Honorary Membership in Rabboni Lodge for Bro. Holm, which was voted June 20, 1957. The following citation on the illuminated scroll presented to this brother read: "His regular and punctual attendance at our meetings has been an inspiration to us all. By his amiable, discreet and virtuous conduct, he has impressed upon us the dignity and high importance of Masonry. By his zeal and ability to disseminate the principles of our Institution, he has promoted friendship and happiness among the members. And by practicing out of the Lodge those duties which have been taught in it, he has brought courage and hope to our sick and shut-ins. It is therefore fitting at this time that we should pause to honor this brother who has so richly deserved our respect and admiration; and to give him the proper Masonic recognition for his long years of service to the Lodge and Fraternity." We finally arrive at the fourth quarter century where the past catches up to the present — at least, as it relates to the history of Rabboni Lodge. To sense the thinking of Freemasonry during this period we draw from what the records reported as having been said at one or another of services of Divine Worship, where so well told were described the aspirations of Freemasonry. For instance, Bro. Stacy B. Southworth of Thayer Academy speaking on "Double Cornerstones of Democracy" cited the connection between the home, church, school and state — how vital each were to the well being of the whole. Wor. and Rev. John R. Haynes Edward L. Everett Lester O. Thomas Clifford S. Brittain Walter S. Donahue Louis H. Mahn William J. Peterson William T. Johnson, Jr.MAGLDImler D. Joseph Imler], Grand Chaplain, speaking on "Our Trust" emphasized the fact that we must practice the tenets of the Fatherhood of God and the Brotherhood of Man, if we hope ever to achieve lasting peace. Rev. Bro. Leonard Helie, speaking on "These Truths We Know" — cited that Man in his nature is Divine. We, as Masons, he said, must try to uphold that Truth. The spirit of tolerance which Masons endeavor to practice must be without regard to race, creed or color. R. W. Edwin C. Childs, Past Deputy Grand Master, speaking on the 'Faith of our fathers' said we do not seem to bear the same loyalty to the church as our forefathers, but loyalty to religion we must remember is the backbone of our civil society. These words come down to us with great impact today as we ponder the wisdom they expressed. Indeed, Masonry has the quality of being a cornerstone in our lives; the Fatherhood of God and the Brotherhood of Man is ever relevant — the more so in a changing world; the spirit of tolerance that enables us to transcend the divisiveness caused by the difference of race, color or creed; and our loyalty to the Divine within us which shows in our relationship to religion — these have been reflected in so many teachings of Freemasonry as we attempt to heed their significance. As might be expected of a Lodge reaching its 100th Anniversary, many of our members have reached life's crest. Almost every monthly meeting includes reports of the passing of one or another of our members, adding a touch of sadness to life's onward trek. Yet one easily senses a gallant spirit and determination to carry the Masonic Way-of-Life to others, with even more understanding and zest. Our membership tended to stabilize from 449 in 1944 to its present level of 327 in 1968 — with 162 assessable members. One of the important leaders who gave outstanding devotion and service from the time he served as Master of Rabboni Lodge in 1923 to his death in 1955 was Wor. Ralph P. Lane. He served as Secretary between 1936 and 19S5. The records indicate that he brought a sincerity, resourcefulness and affability — which quickly marked him for advancement. His excellence as a ritualist was seldom equalled and never surpassed. With all of these abilities combined he possessed a genuine humility which endeared him to his brethren. Any responsibilities or tasks assigned to him were cheerfully and faithfully performed. In Grand Royal Arch Chapter in 1935 he was Principal Sojourner. He was District Deputy Grand High Priest 1936-1937 in the 1st Capitular District. At the hour of his passing he was Secretary of the Board of Directors of the Masonic Apartments; Secretary of both Rabboni Lodge and Dorchester RA Chapter (High Priest 1933-1934). He will always be fondly remembered by many young Masons as the beloved 'Dad' of Crusader Chapter, Order of DeMolay. He was a man who spent much of his life trying to help make the world a better place in which to live. His example will ever be an inspiration. The passing of such an eminent Mason, his Memorial stated, is a great loss to the whole Fraternity. To a host of others it meant parting with a beloved friend whose friendship was ever a delight and whose memory will always remain. Rabboni Lodge continued its visits to other jurisdictions. Such a visit occurred November 20, 1948 when it journeyed to Rabboni Lodge #150 in Lewiston, Maine, to confer the Master Mason Degree in full form on Bro. Lyman H. Brazer. The regular line of Officers occupied their several stations which brought out 235 Masons, including 48 Past Masters — to witness Massachusetts ritualistic degree work. Another expedition was made May 23, 1959 to participate in the 50th Anniversary observance of Hendrick Hudson Lodge #875 F. & A.M. in Red Hook, New York. This was organized by Wor. George Antonopoulas; and never to be forgotten was the hospitality of Wor. Eugene E. Budd and our over night host Bro. Persinger ... Ye Old Table Lodges have been repeated several times. The first such ceremony was conducted December 20, 1956 by Wor. W. Douglas Creighton, with the assistance of Wor. Earle F. Cook, Jr. and Wor. Cyril Wyche, Jr. These occasions have been recorded as interesting and entertaining, in which all of the brethren have joined with wholehearted enthusiasm. There have also been Past Master Nights, evenings in honor of the Ladies, exemplification of degree work by boys from Crusader Chapter, The visits of each District Deputy Grand Master have been significant occasions in the life of Rabboni Lodge. A number of our Past Masters have served as Officers in the 4th Masonic District, for instance: R. W. John C. MacDonald, Jr. was District Deputy Grand Master 1952-1953, as well as a Past Master of the 4th Lodge of Instruction in 1951; R.W. Bro. MacDonald appointed Wor. Louis Kimpel as the District Deputy Grand Marshal. This brother has been Treasurer of Rabboni Lodge since 1951 — the 'work horse' of the Lodge Finance Committee. Wor. Richard S. Maguire was District Deputy Grand Marshal for R.W. Simon Nazarian in 1963 when he served as the District Deputy Grand Master. R. W. Douglas Creighton, Jr. was District Deputy Grand Secretary in 1968 for R.W. Arthur Somerville. R. W. Ralph P. Lane was Master of the 4th Lodge of Instruction in 1930 and Wor. Earl D. Leake served in this position in 1967. Following the sudden passing of Wor. Ralph P. Lane the responsible task of Secretary fell into the hands of R.W. Simon Nazarian. He became Acting Secretary from November 17, 1955 until elected December 15, 1955 and installed January 19, 1956. He has been faithful and dedicated, ready and eager at all times to further every good effort to advance the cause of Masonry — and is one of the remaining stalwarts in Rabboni Lodge. He was Master in 1942; District Deputy Grand Master 1963-1964. He was President of the Canopy Club (Masons in State employ) in 1952, in which he had been a member since 1932. He has been Worthy Patron of Hadassah Chapter #113 OES in 1947, 1950 and 1957. He has been a member since 1955 of the Scottish Rite Bodies in the Valley of Boston; and a worker in Giles F. Yates Council, Princes of Jerusalem. He holds membership in the Masonic Secretaries Association of Massachusetts, the Past District Deputy Grand Masters Association, and in Aleppo Temple A.A.O.N.M.S. The records of Rabboni Lodge spoke warmly of Wor. Maxwell B. Lowman who was Master in 1946 and died soon after in 1949. He was truly one of God's Masons, dispensing the heartiness of good fellowship wherever he traveled. He found a great deal of pleasure in his Lodge affiliations; was always courteous in manner towards those with whom he came in contact; cooperative in the performance of duty. He was active in welfare activities, always willing to do his share and more to enrich and brighten the pathways of those who might need his services. He was earnest, sympathetic and understanding — one of those characters that cannot be duplicated. The "Lowman Past Master's Jewel" was presented to the Lodge to be used by the Presiding Master during his term of office, and to pass on to his successor. Rabboni Lodge has through all its existence been responsive to the needs of others. Since the Grand Lodge Board of Relief was organized in 1912 Rabboni Lodge has paid in over $7,000. When the Grand Lodge established a Masonic Center at Camp Devens, Rabboni Lodge added $1,880 to this fund. Smaller amounts were made to the Masonic home in Charlton towards a freezer and the renewal of the kitchen and pantry floors — as well as to sufferers in areas devastated by floods, earthquakes and other disasters, from Chelsea to Chile. Generous contributions were sent to help in the erection of the George Washington Memorial in Alexandria, Virginia. Beyond the usual and traditional activities the records alluded with pride to the publication for a time of a publication called "Rabbonian", which served as the mouthpiece of the Lodge in its membership contact. For 15 years up to December 15, 1938 it conducted among the Rabboni membership a mutual assessment fund, called the Rabboni Fraternity, which paid to its beneficiaries $5,705. The design used for the Past Master's Apron was designed by Wor. Charles H. Bartlett. Others, too, have served Rabboni Lodge as to add prestige and honor to the Craft each in their way. Wor. Kingdon R. Watt, for instance, served not only for many years as Proxy for Rabboni Lodge at the Grand Lodge Meetings, but was a valuable member of the Board of Masonic Relief. Bro. Isaac Cohen established a record of sorts, for at his death in 1957 he had been a member of the Masonic Fraternity for 63 years. And Rabboni Lodge is proud of Bro. Frank Thorley's service as Tyler which started in 1944 and has stretched into 25 years of faithful duty performed. Until recently one of our most distinguished members was Bro. Henry Penn — known to many as "Penn the Florist". He is believed to have coined the phrase 'Say it with flowers' — and at every possible occasion where flowers could be used, his generosity to his Lodge in floral arrangements, had no precedent. He attended regularly and treasured the Veteran's Medal he received in 1950. He will also be remembered for his gift in 1925 of a set of Officer's Aprons. He died July 29, 1968 at the age of 91. It was refreshing to read in 1965 that a bridegroom had been elected to serve as Worshipful Master of Rabboni Lodge. This brother was Wor. William Noun — and at the May 19th meeting the joyous announcement was recorded in the records that on April 21, 1966 the Worshipful Master had become the proud father of a baby girl. Such news seldom is found by a Historian. Maybe this is a happy note on which to end the journalistic review of a hundred years. We have seen men with vision and spirit give Rabboni Lodge its forward start. We have seen the crusading energy and discipline required to build strong and enduring foundations. We have seen emerge leaders we have been proud to call our own — who not only served, but ably so; and, as now, have been honored even long after their presence has become only a record in memory. What lingers is the gentleness of those holding high aspirations. What edges into our consciousness is the way faith in God played a significant part in making certain lives grow in stature over the years. Life today is full of strange new notions. Regretfully, there is not today the same necessity for sacrifice and humility; nor as many opportunities to build pride in personal achievement; nor the urge to be as actively identified with the Way-of-Life of one's community. Masonry, however, belongs not to the past, nor entirely to today. It is a heritage of a horizon for tomorrow, where men can be made mindful of the happiness that comes with seeking brotherhood, betterment and brotherly love — in all one's relations with mankind. However measured, a hundred years is a long stretch. One is amazed to observe how customs and tastes, habits and practices change; how lives blossom and fade; how honors are held for but a fleeting moment in history. What lingers and is respected, is one's humanitarian spirit; one's concern for living kindly, genuinely and in harmony with others; one's dedication to the sharing of ideals that lead mankind to a sense of brotherhood; and one's inner life to an awareness of God. Masonry has been a wonderful vehicle to measure up to in life — for its way-of-life centers about helping one to his best and the betterment of others. It places firmly in the lives of those who have knelt at its altars the image of God's love, His Spirit and Example. It clothes one with an understanding of man's needs and virtues and conduct, if he is ever to respond without giving offence to others, and in such a manner as to merit the admiration of one's associates in life. It continually keeps one minded through its symbols most expressive, to reach onward hopefully — with aspirations, faith and hope. It guides one, however dark the pathway, to where there can be zest to life, honor in virtue and reward for faithfulness in public as well as private life. It is the hope that as one successfully crosses the barriers of change, as over a century — the yet unknown ahead will ever seem a familiar sequence not too unlike the past. Rabboni Lodge seeks to add something to these oncoming tomorrows. It reveres those who have labored in its quarries to make the past what it has been. If only it can continue to inspire those in its ranks to greater nobility, loftier aims and richer living — the name of Rabboni will hopefully continue to be associated with the making of better men, a happier environment in which to live and higher aspirations for all who come within its influence. Future historians will delight to see new faces emerge, worthy achievements evolve, and faith in God underly all that may await its entry into the tomorrow of life. Onward then let us strive! The First 100 years of the history of Rabboni Lodge was beautifully written by Rt. Wor. Henry S. C. Cummings, Historian, Past Senior Grand Warden and Honorary member of Rabboni Lodge. I can't possibly, and would not attempt to improve on it. I will however borrow just enough from it to lead us into the second century in the life of Rabboni Lodge. I will do my best to highlight the first quarter of our second hundred years. Rt. Wor. Cummings started his narrative with a quote of a previous historian, and I think that is appropriate this evening. "An anniversary of any worthwhile organization in the world today, carries with it great significance to our forbears, our institution and society of today - and to those who must carry our torch tomorrow." Words such as these spoken 50 years ago by R. W. Ralph Lowe, Jr. become even more significant and meaningful as Rabboni Lodge stretches its past into the observance of its 125th Anniversary in 1994. Previous histories of Rabboni Lodge have tried to lay emphasis on 'surrounding circumstances' that prevailed when fourteen members of Masonic Lodges in the vicinity of Boston came together to consider the formation of a new Lodge in South Boston. They had felt the urge, as had many other communities following the Civil War, for 'brethren to dwell together in unity'. Although three Lodges - Saint Paul's 1846, Gate of the Temple 1855, and Adelphi 1865 - offered 'light' to those searching for truth, faith and hope, the task of conferring degrees clearly indicated the need of an additional lodge for this area. With the harmonious approval of these other Lodges, 20 petitioned for the formation of Rabboni Lodge - which was presented to the Grand Lodge December 28, 1868; granted January 11, 1869; and a Warrant signed by M. W. William Sewall Gardner, Grand Master, was received from the hands of R.W. Benjamin Pope, D.D.G.M. of the 3rd Masonic District at the first Regular Communication of Rabboni Lodge while under dispensation. Thus, Rabboni Lodge was created - and on its way in serving God, Country and Humanity - with a proud record of dedication, motivation and conformity to Masonic teachings over the past 125 years. The Masonic Apartments, Westwood, from June 1992 to the present. Our Charter was granted and presented to 21 charter members on March 9, 1870 by M.W. William Sewall Gardner, Grand Master. From those humble beginnings, the membership prospered and grew to a high of 730 in 1926. In 1919-20, Rabboni Lodge received 99 applications for the 'Degrees'. That number still stands as a record in our lodge to-day. The transition from the first 100 years to the next 25 was expertly engineered under the guidance of some very distinguished and dedicated members of Rabboni Lodge such as: Rt. Wor. Ralph Lowe Jr., Rt. Wor. Simon Nazarian, Wor. Bro. Louis Kimpel, Bro. Peter Holm, and a host of other members and Past Masters. I am sorry to say that none of the Brothers I have just named are with us today. But they together with many others who are now members of the Celestial Lodge above, must be happy and content with the knowledge that their teachings and desire for excellence still flourish in Rabboni Lodge. They were tough task masters, as some of us here today can attest, but we continue to reap the benefits of their love of our Fraternity. There is one among us however who was considered an elder statesman then, and who is our Eldest statesman now. I refer of course to Rt. Wor. John C. MacDonald Jr.. Rt. Wor. John is the young fellow who, because of his seniority and stature, escorted our Grand Master, M.W. David W. Lovering, into the Lodge Room this evening. Rt. Wor. John C. MacDonald Jr. and the other 25 living Past Masters at our centennial were the "bridge over which the torch of progress, the desire for excellence and the love of our Lodge and Fraternity" were carried to the Second Hundred years. Twelve of those Past Masters are living today and are among the living 29 living Past Masters on this our 125th anniversary. In reading the minutes of every meeting of the first ten, and the last forty years as well as Rt. Wor. Cummings' 100 year history of Rabboni Lodge I made so many notes of the accomplishments of our Lodge and its members to the community as well as to our fraternity that I was staggered by the editing job 1 had to do so as to keep this summary within reason. Here however, are just some of the things in which Rabboni Lodge was in the vanguard, leading the way or joining the leaders in the last 25 years: Annual scholarship awards to three or more deserving high school seniors in our community Annual "Tenants Awards" to Masons and non-Masons who exemplify our tenants of brotherly love, relief, and truth Maintaining charitable contributions annually even in tough financial years Annual "Fishing Festivals" for the children in the Greater Boston area Continuous blood donor programs Countless visits to the "Sick and Needy" including children's hospitals. Many members of Rabboni whose dedication to Masonry and the community are responsible for the inception and continuation of the above named programs. I must however, mention a few who distinguished themselves in the past twenty five years. Rt. Wor. Simon Nazarian was a faithful member of Rabboni Lodge for 49 years. He served as Worshipful Master in 1942-1943, District Deputy Grand Master in 1963 and 1964. He was an outstanding Secretary of Rabboni Lodge for 25 years. Rt. Wor. Si's assistance and guidance to the Masters and other officers is legendary, especially while serving as Secretary. Reading his beautifully prepared records 1 was amazed to notice how each and almost every month he personally visited sick and distressed brothers and their families. Rt. Wor. John C. MacDonald Jr. who continues to show us the way, is the second of Four Generations of MacDonalds who were members of Rabboni Lodge. He, as well as his son and grandson, Rt. Wor. John C. MacDonald III and Wor. John C. MacDonald respectively, served as Masters of Rabboni Lodge. Rt. Wor. John Jr. and his son Rt. Wor. 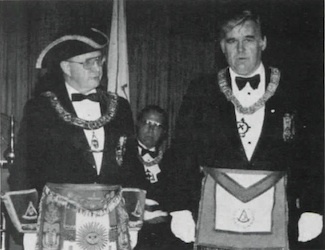 Jack III are probably the only father and son who have been Masters of the same Lodge, District Deputy Grand Masters of the same District, and are both holders of the "Joseph Warren Distinguished Service Medal". Our MacDonald clan are also philanthropists in every sense of the word. Wor. Louis Kimpel Jr. a dedicated member of our Lodge for 53 years served as master 1950-1951, District Deputy Grand Marshal 1953-1955, and Treasurer of Rabboni Lodge for 32 consecutive years. His many qualities will long be remembered and cherished, but who could ever forget that smile? Rt. Wor. Earl D. Leake who in the last quarter century has achieved so many Masonic accomplishments and has participated in so many community programs that we can hardly keep track. He served as Master of Rabboni Lodge in 1963-64 and after 28 years did it again in 1992-93, He is a Past Master of the 4th Lodge of Instruction, he is a Past District Deputy Grand Marshal, a Past District Deputy Grand Master, a Past Potentate of the Aleppo Shrine, a Past Director of Education of the Most Worshipful Grand Lodge of Massachusetts, the representative to the Grand Lodge of Belgium, is or has been on the Board of Directors or Advisors of many institutions including, the Shrine Burns Institute and Children's Hospital, and not surprisingly he is the holder of the "Joseph Warren Distinguished Service Medal". He has been quietly behind the scenes in more Masonic programs both in and out of Rabboni Lodge, and is responsible for the Advancement of countless members of the Fraternity as many in attendance tonight can attest. I'm sure I've missed something but I could probably spend an hour on Rt. Wor. Leake alone. I think I am getting the "evil eye" because of the time, but I should recognize Rt. Wor. Frank W. Pagano Jr. who is also responsible for many of the previously named programs and accomplishments of Rabboni Lodge. In his relatively short Masonic career, he has served as Master of Rabboni Lodge, is the originator and chairman for the first five years, of the Rabboni Lodge "Children's Fishing Festival", a Past Grand Steward, the Masonic Awareness chairman for the Most Worshipful Grand Lodge of Massachusetts, a Past District Deputy Grand Marshal, and is the presiding District Deputy Grand Master for the Dorchester 4th Masonic District. This chap is just getting started! In closing I would like to say thank you to Wor. Walter Oak for helping us close out the first 100 years; to Wor. David Schraft for starting us off on our second hundred years; to Wor. Milan A. Vaclavik, the youngest presiding Master in the history of Rabboni Lodge, for closing out the first quarter of the second century of our lodge and to all those before and in-between for guiding the destiny of our beloved Lodge. We who were the young generation at the end of the first 100 years, are now the old timers who with pride, confidence, and great expectations, pass on the torch to you. Carry it high, and light the way for those who follow. The Fourteenth Annual Communication of Rabboni Lodge was held in Masonic Hall, South Boston, on Tuesday Evening, October 10th, when the following list of officers were elected, and afterwards installed by W. H. H. Soule, D. D. G. Master of the Third Masonic District: Charles H. Mayo, W. M.; Arthur E. Gill, S. W.; Albert H. White, J. W.; Chas. H. Hersey, Treas. ; Henry C. Mitchell, Sec. The other officers were appointed and installed into their respective stations. At the close refreshments were served in the banquet hall, and an hour was passed pleasantly. R. W. John Carr, D. D. G. M. for the Fourth Masonic District, made his annual visitation to Rabboni Lodge, F. & A. M., South Boston, Nov. 10th, and was accompanied by W. Bro. J. F. Newton, D. D. S. G. W.; W. Bro. S. M. Bedlington, D. D. J. G. W.; W. Bro. J. R. Rose, D. D. G. Treas. W.-. Bro. H. W. Gore, D. D. G. S.; W. Bro. Solomon Bolster, D. D. G. Mar. The following were also present as invited guests: R. W. W. H. H. Soule, Past Junior Grand Warden, W. Bro. J. H. Bouvé, W. Bro. David Brewer, W. Bro. E. H. Brainerd, W. Bro. T. H. Harding. Work on the second degree was examplified in an excellent manner by Albert H. White, W. M., assisted by the officers of the lodge. During the evening W. Bro. White was presented with his Past Master's diploma by D. D. G. M. Carr. Later a collation was enjoyed with the usual social features. Among the active and prosperous lodges under the Grand Lodge of Massachusctts we should place Rabboni Lodge of Dorchester near the head. Its meetings are always bright and interesting, its officers are efficient and faithful, courteous to each other and cordial to guests. While the brethren of the lodge have enjoyed many pleasant meetings, that of November 21 was a notable event in its history and will be long remembered bv all who were present as an occasion of extraordinary interest. Among those in attendance were many distinguished Masons, including a delegation from St. Paul's Lodge, Newport, R. I., who were present as a special honor to the master of the lodge, Worshipful Edward F. Newton. Wor. Bro. Newton is a native of Newport and his father and grandfather received their first Masonic light in St. Paul's Lodge. Accompanying them was Rt. Wor. Robert S. Franklin, P. M. of St. John's Lodge, also of Newport, a member of the Rhode Island Legislature and ex-Mayor of the city. The delegation comprised Hon. John P. Sanborn, the oldest senator of the state. Past Grand Commander of the Grand Commandery of Massachusetts and Rhode Island, and Past Senior Grand Warden of Rhode Island Grand Lodge; W. H. Laingley, W. M. of St. Paul's; F. Augustus Ward, Elmer E. Nickerson and William H. Lee, Past Masters; Clark Burdick, Junior Warden and member of the Legislature; Harry H. Lockrow, J. Powell Cousins, C. L. Adams, George W. Sherman, F. W. Putnam, Benjamin White and Ayrault Ward. In the afternoon Edward F. Newton, W. M., and officers of Rabboni met in a preliminary exemplification and after supper, at which about 150, including visitors, participated, the union of ceremonial work took place. Columbian Lodge officers, headed by Leon M. Abbott, W. M.; Paul Revere Lodge of Brockton, Edgar W. Farwell, W. M., and Rabboni officiated in turn, each with an aspirant. Past Master Robert S. Franklin of St. Paul's Lodge, Newport, assisted. Entertaining addresses were heard from Rt. Wor. John P. Sanborn, Worshipful Master Abbott, Chaplain Pritchett of Columbian Lodge, and Rt. Wor. William H. L. Odell, District Deputy Grand Master of the Third Masonic District. Not the least significant of the events came when the presiding officer of Rabboni presented to Worshipful Master Farwell of the Brockton Lodge an impression of an original book plate engraved by Paul Revere, Ancient Grand .Master of the Craft in this state, and for whom the lodge is designated. The work of art was handsomely framed and the acceptance of the token wis made most happily by the lodge's representative. The gift was at the suggestion of A. Winthrop Pope, a member of Rabboni, who is a collector of these little works of art, and more particularly any bearing emblems of the Craft. At the close of the evening Wor. Master Newton presented handsome bouquets to Rt. Wor. John P. Sanborn, Wor. Master Abbott, Capt. Jackson of Columbian Lodge, Rt. Wor. Robert S. Franklin and Rt. Wor. W. H. L. Odell. A card with a facsimile of the first pin worn by a Mason was handed each member on retiring. Old times were so vividly recalled by the sight of the souvenirs that there was a great demand among the Masons for extra specimens as a keepsake. There's no doubt but the Rabboni Lodge souvenir will long be remembered, judging from the favor with which they were greeted, commented upon and put carefully away. The Rhode Island delegation and the Master and Past Masters of Rabboni were entertained after adjournment by Mr. and Mrs. Odell at their residence, Cushing Ave,, Dorchester. Masonic festive occasions are so frequent at this season that it is hardly possible to make a record of all, but some are of such prominence and attended with so much interest and enthusiasm that we are compelled to note them even at the risk of neglecting others. The popularity of a lodge is always an index of the popularity of its principal officers and an evidence of their ability and zeal in its behalf. When a lodge is brought to the front by their methods, by the good work and by the fraternal spirit which they inspire in the lodge and among the brethren, we recognize their value with pleasure. Among officers notable in this direction are those of Rabboni Lodge, Dorchester, Mass., who were installed Friday, January 10. The occasion was one of marked interest. In addition to the brethren of the lodge, many distinguished Masons and charming ladies honored the event with their presence, and the evening was one constant pleasure from beginning to end. About 400 of both sexes thronged the series of apartments given over to the Craft and four hours passed only too quickly in the chain of attractions. The general Reception Committee was composed of the Past Masters of the lodge. The receiving line in the lodge room consisted of Worshipful Master Newton and Mrs. Benjamin S. Frost, Senior Warden Lord and Miss Coffin, Junior Warden Thacher and Miss Farnsworth. Shortly after 8 Grand Master Blake and suite were escorted to the presen e of the lodge and guests by a committee consisting of Past Masters White, Siebert, Charnock, Puffer, Dodge and Frost. Accompanying the Grand Masters were William H. L. Odell, Deputy Grand Master; William M. Belcher, Senior Grand Warden; Oliver A. Roberts, Junior Grand Warden; Walter F. Medding as Grand Marshal; Jerome Smith, P. M. of Rabboni Lodge; W. Miam Morris, P. M. of Adelphi; George A. Patton, P. M. of Robert Lash; W. F. Schallenbach, P. M. of Union; J. S. H. Leard, P. M. of Eliot; Edward J. Fudge, P. M. of Putnam, and Arthur L. Pond, W. M. of Union. There was a most cordial greeting fro Worshipful Master Newton and a felicitous response from the Grand Master. The ceremony of installation was conducted by Past Master Herbert M. Dodge, with Past Master Benjamin S. Frost as Marshal. The following is the organization for 1908: Edward Frederick Newton, W. M.; Francis Stephen Lord, S. W.; George Churchill Thacher, J. W.; George H. Alexander, Treasurer; Arthur W. Hunt. Secretary; Rev. James Huxtable, Chaplain; Frank I. Black, S. D.; George T. Wiley, J. D.; Walter Blair, S. S.; Charles S. Winne, J. S.; Charles W. Fernald, I. S.: Benjamin C. Bird, Tyler. It was the 21st consecutive term for Treasurer Alexander. The Organist played "Auld Lang Syne" as the Tyler advanced to receive his collar, and while the official was on the way to his station the audience joined heartily in singing a verse of the same song, much to his gratification. A massive gold Past Master's jewel, the gift of Rabboni Lodge, was presented to the Worshipful Master by the installing officer in terms of the most eulogistic nature, in which the speaker alluded to the debt of gratitude which the lodge owed to its present head. He hoped it would be an honor to the recipient in years to come as it was a pleasure to the bearer of it in bestowing the memento. The reply was no less an expression of sincere gratitude to the lodge and the sentiment intend in bestowal of the jewel than it was an earnest of what might be expected in the future in upbuilding the membership. Grand Master Blake was introduced as one who stands pre-eminently at the head of Freemasonry in Massachusetts— not only in a personal sense but as the noble mind under whose guidance the Craft had prospered exceedingly. He was thanked for having elevated to a seat on his right hand Rt. Worshipful W. H. L. Odell, a member of Rabboni Lodge. who had been chosen as Deputy Grand Master. To the glowing words the Grand Master said he must confess he found it difficult to strike the gait of enthusiasm that seemed to prevail. He hadn't the least doubt of the sincerity of the sentiment uttered and he would fail to be human if he did not show his appreciation. He congratulated Worshipful Master Newton on his good work and believed that he had earned, and well earned, the right to wear a Past Master's jewel. He was also entitled to a Past Master's diploma, which would come in due time. Rev. Mr. Huxtable, the Chaplain, spoke happily and the exercises terminated in the presentation of a bouquet to the Grand Master, for Mrs. Blake, the Worshipful Master, amid applause, saying that he would forestall such action by handing it to that lady herself. Then Past Master Frost and Past Master Dodge were likewise remembered, with instructions to make similar dispositions of the floral tributes. An opportunity was afforded many of the company to meet Grand Master Blake and Worshipful Master Newton. The program of the evening was concluded by dancing, in which a large number participated, until the hand of the clock pointing to midnight suggested a departure for home. Rabboni Lodge of Dorchester, Mass., is keeping up the record for hospitality and social activity that was started by Worshipful Master Newton when he first assumed direction of the lodge. This fact was illustrated at the regular communication in November when the lodge was honored by the presence of several distinguished Masons, and a throng of its own members and visiting brethren. The special guests included Rt. Em. John P. Sanborn, Past Grand Commander of the Grand Commandery of Massachusetts and Rhode Island, Rt. Wor. Henry H. Ross, Grand Secretary of the Grand Lodge of Vermont, and Em. R. Perry Bush, D. D., Past Commander of Palestine Commandery. There was also present Wor. Joseph T. Paul of Mt. Lebanon Lodge with his officers who were present by invitation for the purpose of assisting in the work. Previous to the evening work a banquet was served and after the close of the work speeches were made by the guests before mentioned. An interesting incident of the meeting was the presentation to the lodge of a book containing a copy of every notice issued during the first ten years of its existence. It was presented by Brother George S. Carpenter, who was secretary during that Period. Worshipful Brother Newton recognized the special guests by presenting them With handsome bouquets. After the lodge was closed the brethren were favored by a musical program under the direction of Brother S. S. Townsend, a member of the lodge. The Grand Master recently visited Rabboni Lodge and presented a Joseph Warren Distinguished Service Medal to Rt. Wor. Earle D. Leake, Past Master of the Lodge and past District Deputy Grand Master of the Dorchester Fourth Masonic District, on Tuesday, April 19. On this auspicious occasion Brothers William Joseph Wells, Michael James Foley, David L. Bowman, Joseph Thomas Morrissey and Malcolm Chester King were raised to the Sublime Degree of Master Mason. Distinguished guests in attendance on that evening were: Most Worshipful J. Philip Berquist, Grand Master; Illustrious and Worshipful Augustus G. Means, Master of Manchester Lodge and Potentate of Aleppo Temple, A. A. O. N. M. S.; Rt. Wor. 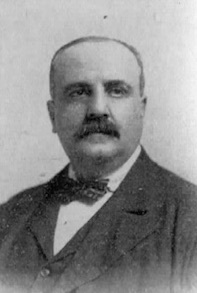 Ernest C. Sofis, D. D. G. M., Dorchester 4th Masonic District; along with the Aleppo Temple Officer's Third Degree Team. A Fifty-Year Veteran's Medal was presented to R. W. John C. MacDonald, Jr., and Meritorious Certificates were presented to R. W. Earle D. Leake, R. W. John C. MacDonald, Jr., and R. W. Emest C. Sofis. The Grand Master presented Outstanding Service Certificates to Wor. Domenico B. Bettinelli, Wor. Joseph Somario, Wor. Robert G. Williams, Wor. Robert J. Jones II, Wor. Osborne V. Webster, Bro. Frank Pagano, Jr., Bro. George A. Anagnos, Bro. Philip Nachinoff, Bro. George H. C. Wong, and Bro. James C. J. Carcerano. A 250th Anniversary Medal with square and compasses attached was presented to each newly-raised brother by the Master of the Lodge, Wor. John W. Bradford, Jr.
Two commemorative plaques with an accompanying donation of $1500 each were presented to the Grand Master and to the Potentate. The donations were intended for the Masonic Home at Charlton and the Shrine Burns Institute in Boston. This page was last modified on 27 February 2019, at 10:24.